Step Up! Never Dance Alone. Our writer at Raffles Press has written this review in response to the posting of a video by “The Mob” featuring “Step Up! 2014” (a dance workshop which they organised). Outside LT1 is an empty, unassuming space, more commonly known as the ‘mirrors’; the atmosphere of this area is usually very laidback after school. But one particular afternoon, the mirrors were jam-packed with people learning to… you guessed it, dance. Step Up! 2014 was a hip hop dance workshop organised by “The Mob” (an allusion to the protagonist dance crew in Step Up Revolution: The Movie) on 8 May after school. The workshop aimed to expose people to what dancing encapsulates — to feel the groove and express themselves. More than 40 participants came down to the mirrors on the long-awaited day; their time did not go to waste. First, there was the welcoming introduction of the dance instructors who would be guiding us through the choreography. They came in all-smiles and really set the mood for the whole event. There was also a short but important warm-up session. Stretching was a really important part of the process, as practicing without former preparation could cause you to pull a muscle. Many then took their first baby steps in following the tune of and matching their moves to the newly met dance instructors. The energy was invigorating with everyone shaking, stepping, leaping to the beat of “Now or Never” by Kendrick Lamar. The song itself was really upbeat with a repetitive melody that made it easier to follow. Some struggled; my psychomotor skills failed me as I mixed up my right arm for my left. 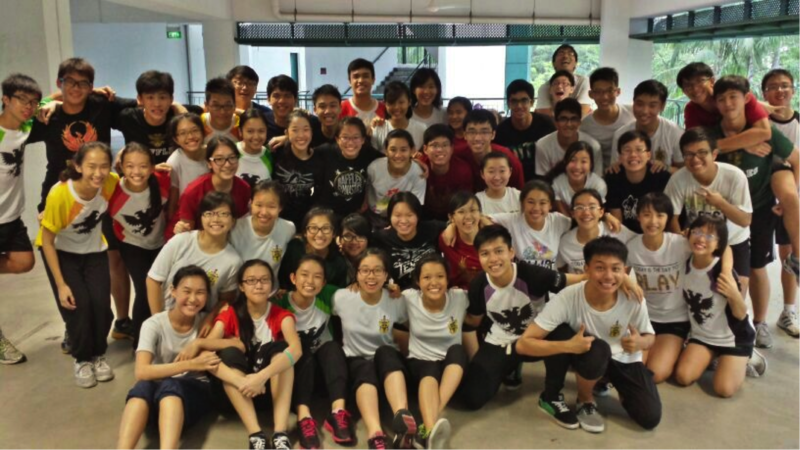 Fellow participant Cayson Chong (15S07D), admits that he was really bad at dancing and “probably would never have dared to try dancing in front of so many people.” Nonetheless, everyone was pumped up and ready to put in their best, even continuing to practice during the water breaks. As Step Up’s motto goes, ‘We believe that everyone has a dancer in them- so why dance alone, and hide away the myriad of colour and potential waiting to be discovered?’ Even though the workshop was only 2 hours long, the inspiring talks that the various dancers gave about their humble beginnings gave us insight into what dance really is all about. One such example would be of Yao Cheng Hui (14S06K), who learnt the moves together with the rest of the participants. Although Cheng Hui is a bowler, he comes down to the mirrors to dance and have fun whenever he wants to kill time. When asked about his first experience dancing, he replied, “Well, it was really quite awkward at first because I wasn’t really that good at dancing.” But as he spent more time polishing his craft, Cheng Hui managed to learn more about dance and grow as a dancer. The workshop was a great success as even though not everyone was able to perform the dance at 100%, we were all able to learn something at the end of the day. I was finally able to get a feeling of the ‘expression’ of dance even if it was only for a short while. As the workshop came to an end, everyone put their hands to the center to give one final resounding “Step Up!” for a final send-off.